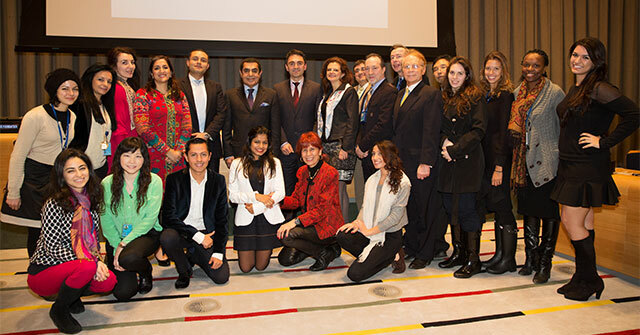 The High Representative for the United Nations Alliance of Civilizations, Mr. Nassir Abdulaziz Al-Nasser convened an informal meeting with representatives of the civil society on 21 February 2014 at UNHQ which focused on “Unity in Diversity – World Civil Society”. The two day meeting which was held in the Trusteeship Council , was the official launch of Unity in Diversity – world Civil Society, an autonomous and inclusive assembly of civil society organizations focusing on implementable and achievable projects that contribute to the mission of the UN Alliance of Civilizations, and strengthens collaboration at country, continental and global levels. “In coming to us with this smart initiative, you are finding a niche within the UN Alliance of Civilization’s framework and alongside our line of activity”, the High Representative noted. Membership of “Unity in Diversity – World Civil Society” is made up of civil society organizations, individuals, private companies, corporations and associations, active in the field of intercultural dialogue and cultural diversity and serve as the direct link between the Alliance of Civilizations and grassroots community-based organizations. Participating in the meeting were several Partnering Organizations from 18 countries, including by video conference. Also in attendance were representatives of the Alliance member states: Algeria, Russia, Brazil, Costa Rica and agencies UNESCO, OIF, WANGO, Manhattan Multicultural Counseling, UN Academic Impact, NGO DPI, Fairleigh Dickinson University, among others. “As an independent organization, we are committed to furthering the mission of the Alliance of Civilizations and anchoring it within grassroots communities around the world. Although some of the Champions could not come to New York, they have a strong will to contribute to building our world using their own voice, so that our world can be complete and look and feel like a beautiful home for everyone, filled with understanding, unity, respect and tolerance, said Peter (Pece) Gorgievski, Global Dialogue Foundation’s CEO & Director-General. Unity in Diversity – World Civil Society presents unique opportunities for communities from all cultural and ethnic groups, to collaborate, engage with business and corporate, and strengthen their capacity to become sustainable and contribute to mainstream society. 2. Providing a link between the UNAOC and grassroots community-based organizations; 3. Participating civil society organizations would meet with the Group of Friends Focal Points in their countries of operation in order to connect with international bodies.